The half moon is a traditional side stone shape and will enhance a brilliant center stone of any diamond pendant or three-stone engagement ring. Half Moon Diamonds were created specifically to be used as side stones. They are used to enhance the a brilliant cut center stone in a three-stone diamond engagement ring and create a larger look and accentuate the size of the center stone. CaratsDirect2u can create layouts to customize your three-stone diamond engagement ring or diamond pendant necklace especially for you. 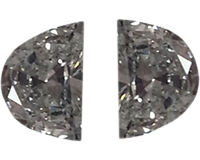 Be sure to check that the pair of Half Moon Diamonds are very close in dimensions, as well as similar in color and clarity grade.